As soon as I heard the devotional kit for October was called #WordNerd I knew this would be very me. I’m a total Word Nerd: I love to read and write, I have a house full of books, I have a Bachelors in English Creative Writing and Poetry, I’m a self-professed grammar nerd, I wear glasses, I’m a nerd in so many other ways, and I love Jesus and studying his word! And that is truly what this kit is about: digging deeper into the Word. To see a full unboxing video of the Word Nerd kit, click here. Not only will I be journaling in my Bible with all the cute pieces from this kit, but I decided to make a paper bag book for the devotional and journaling cards. You can see a tutorial and flip through video of my Word Nerd paper bag book here. It was so fun to grab a bunch of my favorite pieces from my scrapbooking days and add them to this book since I didn’t have to worry about the thickness. I used half the kit and each of the stamps at least once while making my book, and I still have pieces left over to use in my Bible. That just shows you how much is truly packed into these little kits. I’m so happy to see that this kit included more verse options for studying and journaling than September’s kit. 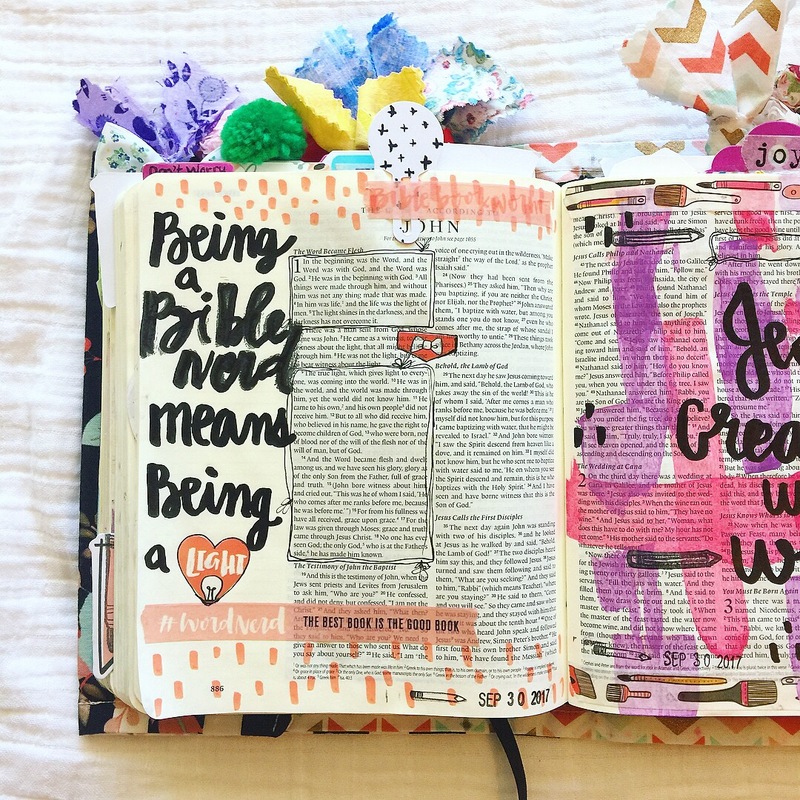 I’m really excited to dig in and read God’s word this month, because after all that’s what Bible journaling is about: connecting with God’s word and writing it on our hearts! You may notice that there are no heart shaped tip ins this month. Honestly I haven’t really missed them, mainly because I didn’t really use them as much as I thought I would in the previous months. But I just thought I would mention that they are omitted this month in case anyone was wondering. I will say that I wish the stamp set had included at least the cute little bow and drink cup like the die cut pieces included, instead of the phrase “the word lights the way,” just because I can’t really see myself using that specific stamp over and over again. I like stamp sets to be something I grab repeatedly, even after I’ve finished the devotional. I know for sure that I will use the girl silhouette over and over again, she is super cute! The other great thing that I liked about Word Nerd is that it makes a great sequel to Created to Create 2. In fact, I’ve been using the two kits together both in my little book and in my Bible, since I hadn’t finished Created to Create 2 yet. The colors go together perfectly, and for me, writing and creating go hand-in-hand. If you haven’t had a chance to pick up Created to Create 2, grab it here. Overall I would say that this kit really is probably my favorite so far this year. Because I love it so much, I decided to giveaway one Word Nerd kit over on my Instagram @kountingsheepbiblejournaling, so head over there for details on how to enter (giveaway runs from 10/2/17-10/6/17)! And if you can’t wait to get started like I was, pick up the Word Nerd kit here (don’t forget to use code IFSHIPSFREE for free domestic shipping). If you end up making a paper bag book, tag me on Instagram I’d love to see it! Please note that this post contains affiliate links. This means I receive a small commission when you purchase through my links, but there is no additional cost to you. All opinions and pictures contained in this post are my own. I purchased the giveaway Word Nerd kit on my own, so the giveaway is not affiliated with Instagram, Dayspring or Illustrated Faith. I did receive my Word Nerd kit from Dayspring in exchange for my honest review.